Eugene Kohn is founder (1976) and chairman of Kohn Pedersen Fox Associates, one of the world’s ranking design firms. Gene is a frequent moderator, juror and keynote speaker on contemporary architecture. He has lectured at numerous universities, and for professional organizations and institutions across the US and around the world. An Executive Fellow of the Graduate School of Design at Harvard University, the first architect to be awarded the title, is a graduate of the University of Pennsylvania. He is also a Fellow of the American Institute of Architects – and served as president of the AIA New York City Chapter, a member of both the Royal Institute of British Architects and the Japan Institute of Architects. 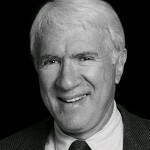 Gene helped establish and teaches at the Harvard International Real Estate Center, is an Overseer for the School of Design, and is a member of the Wharton Real Estate Center Advisory Board. He is a Trustee of both the National Building Museum and the Urban Land Institute. This entry was posted on May 14, 2009 at 1:35 pm, filed under Podcast and tagged Gene Kohn, Kohn Pedersen Fox, Sound Advice. This was an exceptionally valuable podcast delivered by one of the masters of the architecture and real estate professions. I especially appreciate how his vision and resilience rubs off on the listeners here at Greenway Group and how his leadership is making a difference — even in this tough economy. What a positive voice for sound advice now.